"Have you noticed that the waterfall is shrinking?" Ogondo chattered. "It seems to be getting smaller every day." "That’s because the dry season is coming and less rain is falling," Taji, the crane, explained. "What? No waterfall?" Zesiro shouted. "How will we shower? How can we bathe in the pool at the bottom? Will we still have bananas and delicious fruit?" the monkey asked. The sun was high in the sky. The temperature was rising daily in the savanna. Even near the great mountain the heat was getting unbearable. The giraffe walked over to the falls. "Let’s enjoy it while we’ve still got it. As the rivers dry up, the other animals may find their way here," Gamba said. "Animals, like lions and cheetahs?" Zesiro asked. "Perhaps. Remember the pride of lions that were on the boulders during the flood when we first came here? There are lions about. Let’s hope they find water somewhere else," Gamba answered. Just then Ogondo pointed at something. "What are those black dots in the sky?" The others looked. "It looks like birds," Taji said. As the black specks came closer, Taji could see that they were indeed birds. 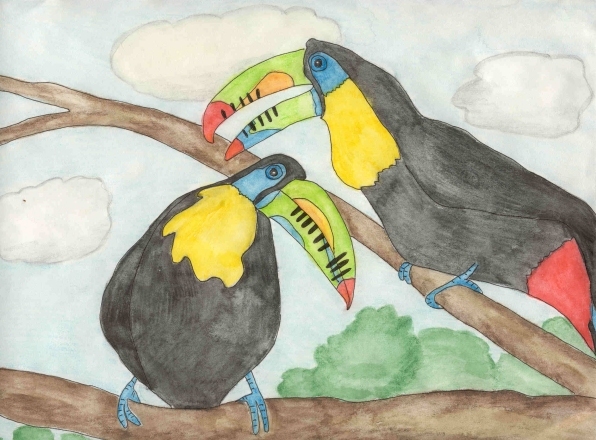 "Those are toucans." The birds flew closer and closer until they landed next to Taji. "It’s true. This is a paradise," Kasinda squawked. "Look at all the trees and grasses." "Finally we’ve found somewhere green," Aitan sighed. "Where have you come from?" Taji asked. "The savanna is drying up. There’s little water left. The animals are fighting around the waterholes. We heard you four speaking about the great mountain and when you didn’t come back, we guessed you must have found it. Where’s that delicious fruit that tastes like honey?" Aitan wondered. Ogondo, Zesiro, Gamba, and Taji looked at each other. They weren’t sure if they wanted two noisy toucans in their territory. "Why don’t you go further east? I hear there’s plenty of water there," Ogondo said. "Isn’t there room for us here? We’re only two birds. We only eat fruit and we don’t make a lot of noise," Kasinda smiled. "You’re welcome to stay here with us," Gamba said. "There’s room for you. The trees are covered with delicious, ripe fruit. Help yourselves." The toucans squawked and flew over to the nearest tree. It didn’t take long for the group to realize they’d made a mistake by allowing the toucans to stay. While Ogondo and Zesiro were playing in the waterfall, the toucans flew over. They fluttered their wings and spread them. The wings were like big umbrellas. "Hey! We’re not getting any water down here," Zesiro whined, but the toucans didn’t pay any attention. They ignored the monkey and kept their wings spread. The trickling waterfall splashed on their huge, black wings. Aitan opened his bill and let the water cascade in. Drops dripped over the edge onto Ogondo’s head. "This isn’t much of a shower," he mumbled. The monkeys ran off to find Gamba and Taji. "Gamba, I don’t like those toucans. They are hogging all the water from the falls," Zesiro complained. "Their wings are big and I keep finding feathers in my fur. They make a lot of noise and their bills are so big that it takes twenty fruits to fill it up. Soon we’ll have no fruit left." "They can’t even fly well. They hop most of the time. I don’t like them. I want them to go," Ogondo said. Gamba was irritated with the toucan’s squawking but tried not to let it bother him. "We’ve got to be patient. They only came here because there was no fruit in the savanna." "But they spit their seeds all over the place," Ogondo added. "Patience. What do you think, Taji?" Gamba asked. She was busy preening her feathers when the monkeys arrived. "I don’t particularly care for their habits, but we’ve got to help each other out during the rough times." "Oh, all right. Come on, Zesiro, let’s go swing in the trees," Ogondo said and ran off, the other monkey following right behind him. Gamba shook his long neck. "It’s going to be a long summer," he sighed, watching the monkeys in the trees.